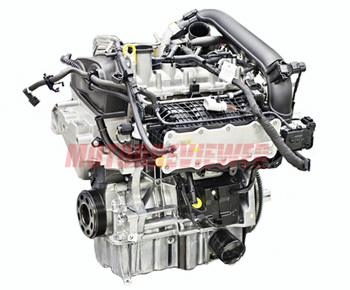 The 1.4 TSI of the EA211 series is a 1.4-liter four-cylinder gasoline turbocharged engine. The new EA211 engine family was designed to use in VW’s MQB platform which involves a certain unification of the engines too. At first glance it might seem that the new 1.4 TSI is a modified version of the 1.4 TSI EA111 engine because they have similar power output, look, and displacement, but it is an entirely new engine based on the experience of designing and production of previous small turbocharged power units. First of all, the 1.4 TSI EA211 has a lightweight aluminum cylinder block with cast iron sleeves (liners) instead of complete cast iron block. There are a new die-forged steel crankshaft and connecting rods. The stroke was increased to 80 mm while the cylinder bore was decreased to 74.5 mm (by 2 mm). The engine with new components became lighter by 24.5 kg than its predecessor. The engine block is tilted by 12 degrees backward and the exhaust manifold is always at the back side near the firewall. That allows achieving more unification between cars built on MQB platform. The engine has an aluminum alloy 16-valve DOHC cylinder head with an integrated water-cooled exhaust manifold. The camshafts are driven by timing belt now (not a chain). The 122 hp versions have variable intake timing only. The 140+ hp engines incorporate both variable intake and exhaust timing. As before, the 1.4 TSI is equipped with hydraulic tappets and roller finger cam followers provided an automatically valve clearance adjustment and low friction. The engine has a turbocharger system with water-cooled intercooler integrated into the intake manifold. The cooling system for the 1.4 TSI has two loops. A low-temperature loop flows through the intercooler and turbocharger housing. The integrated exhaust manifold reaches its optimal operating temperature very quickly after the engine is started; it also cools the exhaust gases at full power mode increasing a turbocharger lifespan. The catalytic converter is mounted beyond the turbocharger for a quick warming up process. Like the predecessor, the 1.4 TSI of EA211 has direct fuel injection system. The maximum injection pressure of the high-pressure pump is a 200 bar. The cylinders are equipped with five-hole injection nozzles precisely delivered fuel inside combustion chambers with up to three individual injections. The 1.4 TSI 103 kW (140 hp) with ACT system can switching off two cylinders for a less fuel consumption. Compare to EA111 1.4 TSI, the new engine got rid of its main shortcomings. The stretching out timing chain was deleted and replaced with timing belt designed for entire engine lifespan (that is VW’s official statement). Now, the engine is able to warm up in a cold weather. The turbocharger suffers fewer from wears due to cooler exhaust gases, almost like diesel engines have. At the same time, the EA211 1.4 TSI has an advanced design, more complex components, and electronic systems. That makes it even more expensive to repair. CMBA/CPVA - 122 hp version. It has 0.8 bar boost pressure, 10.5:1 compression ratio. Application: Golf Mk7, Seat Leon 3, Skoda Octavia A7, Skoda Rapid, Audi A3. CZCA/CPVB - 125 hp version with 0.8 bar boost pressure, 10.5:1 compression ratio. It meets European emission standard Euro6. Application: Golf Mk7, Skoda Rapid, Audi A3. CHPA - 140 hp (103 kW), 250 Nm at 1,500-3,500 rpm , 1.2 bar and 10.0:1 compression ratio. Application: Golf Mk7, Seat Leon FR, Skoda Octavia A7, Audi A3. CPTA - CHPA engine with ACT system. CZDA/CHPB - 150 hp and 184 lb ft. The max boost is 1.2 bar; compression ratio is 10:1. CZEA - version with ACT system based on CZDA engine.